The first bubble I ever saw was the dot-com bubble of 1999. I was born in the early seventies, and I made it to my mid-twenties before ever hearing about an asset price bubble. Commercial real estate went nuts in the eighties, but nobody ever called it a bubble. They didn’t even call it a crash when it crashed. Bubbles aren’t new—they’ve been around since Dutch tulips—but it’s only recently that they’ve worked their way into the average investor’s lexicon. 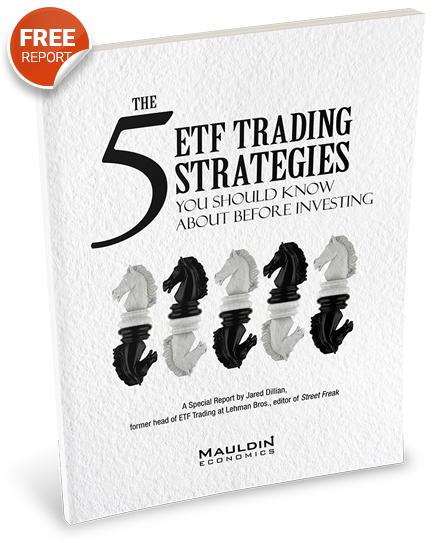 If you asked the man on the street, he would probably tell you there are five different bubbles going on right now. There is some truth to that, but also some untruth to that. The true part is that a lot of things are currently overvalued. I would say stocks are overvalued. Most people would agree. I would also say bonds are overvalued. Some people would agree. I would say corporate credit is overvalued, real estate in certain parts of the country is overvalued, and maybe a few other things. But these are not bubbles. So, what is the difference between something being overvalued and something being in a bubble? A bubble is a psychological phenomenon that occurs when an asset class becomes overvalued and is accompanied by an obsession or preoccupation with that asset class. For example, you probably heard that the Dow just hit 20,000. It is not a bubble. Nobody is obsessed or preoccupied with the stock market. You don’t have Coast Guard guys day-trading it like when I was still in the service in 1999. That was a bubble. In fact, nobody really gives a crap about today’s stock market. Usually they have CNBC on in the locker room at my gym. Nobody pays any attention to it. By that standard, there are very few bubbles in the world right now. But there is a bull market in people running around calling everything a bubble. Please ignore those people. The only real, honest-to-goodness asset price bubbles out there are in residential real estate in Canada, Australia, and Sweden. 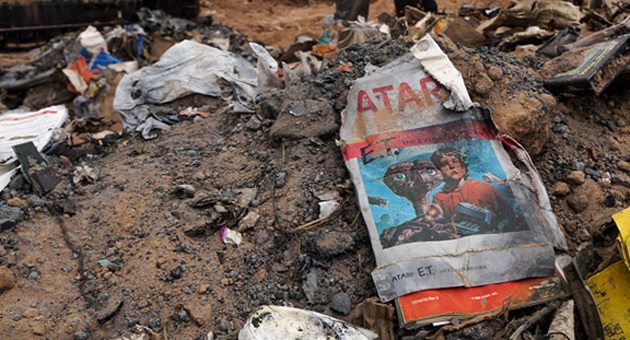 They are going to end up in the landfill in New Mexico with all the Atari E.T. cartridges. If you didn’t get that reference, you can do some background research here and here, but suffice it to say that there was a bubble in video games in the early eighties. It did not end well. People (including me) were pretty bulled up on Atari 2600 video games back in the day. This led to Atari getting a little out over its skis, producing way too many games and ending up with a boatload of excess inventory. The situation was so embarrassing to the company that they dumped them all in a landfill in New Mexico in the middle of the night. The games were excavated (by archaeologists!) over 30 years later for a documentary. Concurrent with the dot-com bubble was the Beanie Baby bubble, which probably got less press than it should have because people were preoccupied with stocks at the time. 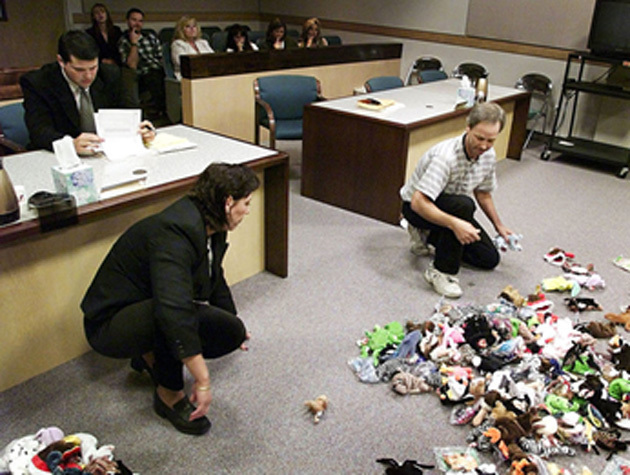 I included this photograph in a recent issue of The Daily Dirtnap—a divorcing couple dividing up their Beanie Babies in court. One of the consequences of the financial crisis is that any time the price of anything goes up, anywhere, we think it is a bubble. We have been psychologically scarred. We will always confuse legitimate bull markets with bubbles. I noticed myself doing this recently. I observed that prices of houses in my neighborhood are at last going up, and my first thought was—I should sell! It’s a bubble! Actually, it probably isn’t a bubble. It’s probably a healthy bull market, and you could make the case that houses in my neighborhood had been chronically undervalued. But I was so traumatized by the crisis, that for the rest of my life, bull markets will make me nervous. That’s too bad, because the best way to play a bull market is to be long and strong and just not worry about it. The worst way to play a bull market is to sell the first uptick. I’m being serious. 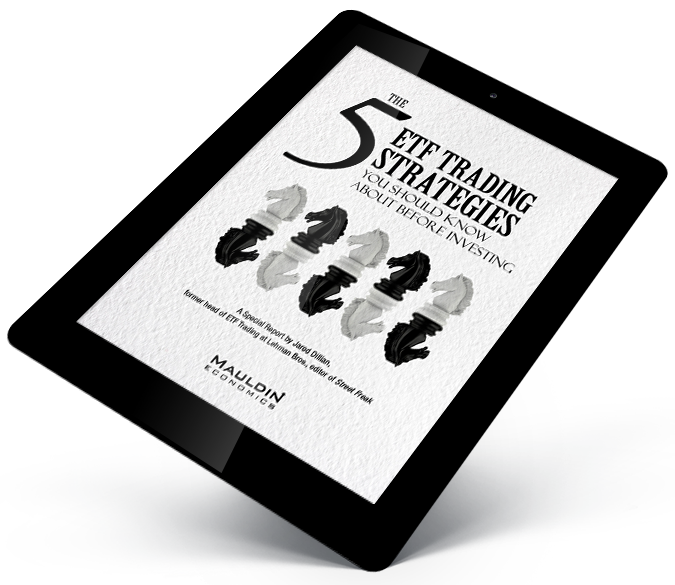 If you’re not a “professional” investor, the worst thing you can do is to be trigger happy. Especially with retirement accounts. Retirement accounts are for retirement, so whether something is in a bubble or not is generally of no consequence. Timing the cycles is really, really hard. Generally, this is what happens when people try to time the cycles—they sell out of asset class X and then watch helplessly as it goes up for three more years. That’s the thing about bubbles. Just when you think they are stupid, they can get a lot stupider. That’s been my experience with Canada, as house prices went from stupid in 2013 to very stupid in 2015 to OMG so stupid in 2017. It’s my job to figure out how to time the cycles, but even with all this experience, it doesn’t seem like I’m getting any better at it. If I wanted you to take away one thing from this piece, it is this—if you hear someone on TV squawking about how XYZ is in a bubble, try to evaluate it a little more critically. Here’s a heuristic—if someone calls something a bubble, just set your phone to go off three years from now. Then it will be in a bubble. And you will know, because your uncle and your dentist and your old high school buddies will all be involved. April 22, 2017, 2:01 a.m.
A) Overvaluation? = yes, I am a Hong Kong-based real estate number cruncher and the current Toronto price level is way above the standard deviation bandwidth using a 30 year nominal average price horizon, not to mention an increasingly not so affordable price to income ratio. B) Bubble? = yes based on your criteria. Both industry (e.g. brokers, fund managers, developers) and non-industry folks (e.g. homeowners, individual investors) were / still are mostly and generally bullish. I was in Toronto last month (March 2017) for two weeks and real estate seemed to fill almost everyone’s mind e.g. there was this subway ad promoting a huge real estate exhibition-forum featuring Tony Robbins et al. C) Properties can now be sold within days i.e. less than a week with multiple offers, especially for listings priced below C$1M. D) Reportedly a few Canadian banks are now expressing concern and may tighten up lending (Too late? Maybe). E) Despite the 33% price increase (from March 2016 to March 2017), do note Toronto properties still look inexpensive to some overseas investors e.g. those from Hong Kong / China whose own metros’ real estate prices might feel even more outrageous. For instance, most top of the line Toronto residential condos are still priced below C$1k per ft2. Translate this C$1k to around Hong Kong $6k. For HK$6k per ft2, practically there is no listing in Hong Kong selling at that (low) level and top of the line condos - and practically everyone in Hong Kong lives in a condo - in Hong Kong starts at HK$25k-30k per ft2, and higher. F) I suspect if the push comes to shove, the Canadian authorities might prefer to devalue the Loonie than let the real estate [asset] markets bear all the plunge. Hope you would find the above of use. April 20, 2017, 2:07 p.m.
What housing bubble in Canada and Australia? Prices there are very cheap compared to here in eastern Asia. There are numerous cities here where the average 2-bdrm upscale (but not top-end) condo runs US$25-mil. Add $10-mil for a sea view. I see that today a 2-bdrm rowhouse in a working-class area of central Toronto just sold for Cad$4-mil, asking $3-mil… wow that’s great value! April 20, 2017, 11:52 a.m. I find your posts to be very thought-provoking, but I think it’s worth mentioning that prices don’t have to be in a bubble, as you define it, in order to crash. By your definition stocks were not in a bubble in 2007, although housing was, but stocks still dropped by over 50%. If we look at why the stock market is up so much over the last 40 years, I would suggest that it is primarily due to a massive credit expansion, and if/when that credit/debt expansion comes to an end, markets are likely to suffer an implosion, as everyone tries to get their money out before prices drop further. Writing this, I just realized that market crashes are probably a more common form of bubble mentality, but in the negative direction. That is to say, people may not be paying a lot of attention to the rising stock market or housing market or whatever, but let those markets start collapsing, and EVERYONE is paying attention and talking about it, and if exposed, panicking. The madness of crowds is far more evident on the downside than on the upside.